Today marks another championship clinching date for the Royals, this one for the magical 1985 season. Both by date on the calendar and game of the season, this clinching date was the latest in Royals history. Saturday, October 5, 1985, was the next to the last game of the 1985 season and the Royals were home against the Oakland A’s. The Angels started the day two games behind with two to play but had already defeated the Rangers in Arlington early that afternoon; the Royals needed to win or California could still catch Kansas City for a tie at the wire. Willie Wilson made sure game 162 was irrelevant. 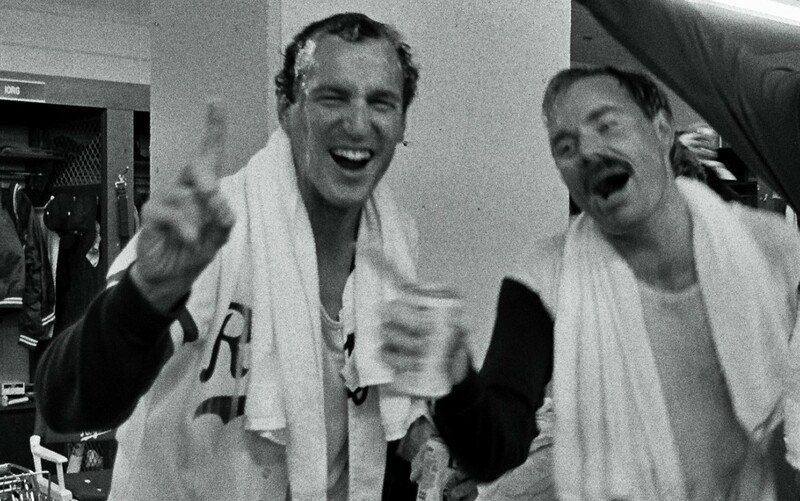 Just A Bit More: The starting pitcher in the clinching game was none other than Bret Saberhagen who tossed the first six innings followed by one scoreless inning from Joe Beckwith and three scoreless from winning pitcher Dan Quisenberry (that is Quiz and Charlie Leibrandt celebrating in the above picture). Saberhagen would also start Game Seven of the ALCS but left in the third inning with an injury. And of course, he was the starter in Game Seven of the World Series when he shutout the Cardinals for the title. Three clinching games, three starts for Saberhagen and he definitely saved his best for last.